Market sentiment: Confident. The Fed’s pause on further rate hikes, and its announcement that it is likely to keep its balance sheet larger for longer than previously thought has combined with optimism on the U.S/ China trade talks to contribute to continued investor interest in risk assets. Given that stock market valuations remain attractive on most measures, for most regions (including the U.S), there appears limited downside over the coming months if 1) U.S inflation remains mute, depriving the Fed of a reason to reverse course again, and 2) a U.S/ China trade deal does emerge. However, investors should keep an eye out for potentially disruptive news items that could upset this benign outlook. The VIX index of implied volatility on the S&P 500 continues to reduce, currently standing at 13.5. The U.S/ China trade talks may still break down – this is perhaps the largest near-term risk for investors at present. If so, higher tariffs and quotas on trade between the two countries would result that will reduce trade and lead to increased inflation. If no deal is made by 1st March, Trump will seek to double current tariffs on Chinese imports to the U.S, affecting $200bn of goods. China will undoubtedly counter with more quotas and tariffs aimed at exports from Trump-supporting states, notably soya from the mid-west. It should be added that the U.S fears regarding China go well beyond subsidized state-backed companies dumping products, hostility to foreign investment and copyright in infringement. There is a suspicion that China’s drive to assume technological leadership in five key areas (outlined in Beijing’s Made in China 2025 project), will be achieved through stealing U.S technology and using it to achieve technological dominance over the U.S. No trade deal can calm that fear. However, Trump is in need of a deal with China to help shore up the U.S voter support as the 2020 election campaign begins (the U.K betting company Ladbrokes has Trump at 2-1 favourite, followed by the Democrat Kamala Harris - at 5-1). And China needs a deal to shore up its economy, which has decelerated considerably in recent years. Anecdotal evidence suggesting GDP growth may be half the official estimate of around 6%. This explains why investors believe a deal, of sorts, will be reached. Last week Trump appeared to offer an olive branch to Beijing by Tweeting that ‘I want the United States to win through competition, not by blocking out currently more advanced technologies’, which was taken to mean that the White House may offer some concessions to the Chinese telecoms company Huawei, after months of urging its western allies to boycott the company from 5G network planning. In addition, Trump appears ready to meet with China’s most senior trade negotiator – which is being interpreted positively. A surprise rise in borrowing costs. Borrowing costs in the U.S and elsewhere may yet rise, irrespective of the Fed and other central banks’ actions. First, the Fed may be underestimating the potential for wage growth feeding through into inflation, with the result that it needs to play ‘catch up’ with interest rates. Raising the dollar in the process, and putting pressure on other countries -particularly emerging markets- to follow suit in order to protect their currencies. This would put the current rally in risk assets into reverse. Second, the U.S government’s almost $1 trillion budget deficit (and growing) risks ‘crowding out’ the private sector. By which is meant that the household and corporate savings that are currently channeled into private sector businesses, through equity and debt markets, will be increasingly required by the U.S government to fund the deficit. This could lead to higher Treasury yields, to attract the funds a shortage of capital available for the private sector which may struggle to compete against more attractive risk-free rates. This, in turn, will lead to higher corporate bond yields (i.e., a fall in bond prices) and cast a shadow on stock markets. Brexit. Is a sterling rally imminent? It is if Brexit is delayed, and a very soft Brexit emerges. Which I’d offer a 50% chance of happening. An amendment to Theresa May’s E.U Withdrawal Agreement bill will, if passed by the House of Commons, would force the government to seek an extension to Article 50 if May fails to secure House of Commons support for her bill 13th March. This would delay the date of Brexit and avert a chaotic no deal. Since it is unlikely that May will win the concessions that she needs from E.U leaders over the Irish backstop part of her bill, it is likely that -if the amendment is voted through- an extension to Brexit will happen. Commentators believe this will be for three months, giving the government until late June to get a Withdrawal Agreement and additional Brexit-related legislation through Parliament. Last week seven Labour MPs, and a handful of Conservative MPs left their parties out of disgust at the policies of their leaders. The ‘Independent Group’, as they are currently known, could have a decisive effect on the two main parties, forcing their leaders to pay as much attention to their anti-Brexit MPs as they do to their pro-Brexit MPs. An extension of Brexit by three months may result, therefore, in a very soft Brexit indeed if May feels obliged to scrap some of her ‘red lines’ on Brexit. For instance, a commitment to remain in the customs union forever – not just while the Irish backstop is in place- would significantly reduce the Irish border problem, although it would scupper Brexiters dream of the U.K doing its own trade agreements around the world. It would be illogical to be in the customs union and not in the single market, given that the U.K currently meets all E.U single market rules and Northern Ireland will remain in the single market as long as the Irish backstop is in place. So why not stay in the single market too? Or, rather, parts of it…a little like Norway. The E.U has always insisted that the four freedoms of movement that define the single market (of people, capital, goods, and services) are indivisible. It is all or nothing, and it is the free movement of people that most irritates Brexit supporters. But I wonder if the E.U’s position might alter? The coming European Parliament election is predicted to result in wins for a large number of populist, euro-skeptic parties. Many of these see refugees and the E.U’s freedom of movement are two sides of the same problem and may be sympathetic to the U.K seeking an opt-out of that particular freedom. It is the Council of Ministers that will sign off any changes to the withdrawal agreement, but they will want to be seen responding to their voters’ concerns which a newly elected European Parliament will demonstrate. A multi-asset portfolio for the long term. We favour a long-term run approach to investing, whereby investors choose a suitable combination of global equities and bonds (depending on their risk profile and investment horizon), and leave the portfolio unchanged. Regular re-balancing ensures winners are sold and losers are bought – which financial history, and common sense, supports. 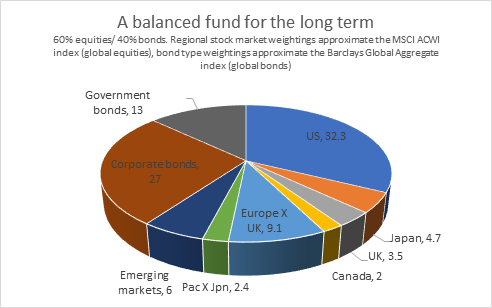 The chart below shows a typical long-term balanced portfolio based around 60% global equities and 40% global bonds. Financial history shows this combination to offer good returns relative to risk (ie, volatility). Investors should try to be as diversified as possible, perhaps using the 60/40 model as their guide. Multi-asset funds based on this principle are available, often with different ratios of bonds and equities depending on the level of risk suitable for an investor. Note that the chart shows neutral weightings for the long-term investor, it does not incorporate any near-term weighting suggestions made in previous paragraphs.